It seems that the main premise of this show is that this is a spin-off series to the Walking Dead. I know that sounds redundant, but after watching the pilot, it seems clear that the producers were only banking on the fame and popularity of the main series to sell this show. In fact, the entire plot of the pilot essentially builds off the dread of all the events that the audience knows is coming. We watch as the populace ponders the crazy events taking place on the news, while simultaneously downplaying the threat by going about their daily routines. As an audience, I think we are supposed to yell at the screen "Oh my god, you have no idea what is coming! Run for the hills!" In reality, it comes across as anti-climatic, because the stuff that is coming in the future is much more interesting that the show that we are watching now. If this show does not catch up, it is in real danger of being the dull younger brother of a much more interesting show. Clearly, I am a fan of the Walking Dead series, but I do acknowledge that the main show also has its flaws. The biggest of which is wasting time with filler episodes that are full of back stories no one really cares about. I am almost dumbfounded by the fact that "Fear the Walking Dead" inaugurated its series with such an episode. And when the show finally presents the zombies to its main characters in all its gory glory, it is very underwhelming. We have seen much more impressive and terrifying scenes from the original series, and one little zombie is not at all impressive anymore. Now I know the creators will defend the slow start as necessary back story. The problem is, the back story for the main cast is not very interesting, and actually very clichéd. Like almost any apocalyptic sci-fi story, we begin with a fractured family that is dealing with a recent divorce and a child with a drug problem. The entire family is at odds with each other, and the family is essentially broken. Thank God a zombie Apocalypse is right around the corner to bring them all together again (at least we assume that is where we are going). How many times have we seen this story? Not exactly original or riveting stuff. 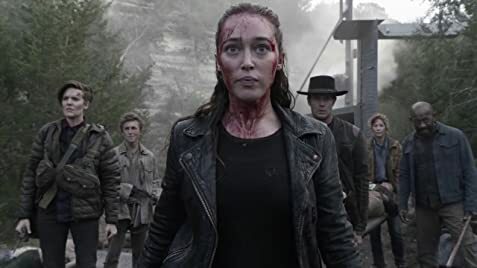 The overall premise of the show is very promising, as I do think it will be interesting to see what the zombie apocalypse looked like from another perspective. The event itself should be enough to inspire countless stories. Although, you have to wonder exactly how the slow moving zombies will overtake the modern world with all its modern communications and well equipped armies; at this point I am not sure if the show will deliver a convincing answer. As it is now, I hope the series steps up the writing, as you cannot rely on the good will from another show to keep your audience. I for one will keep watching for now, but my patience is not infinite and neither is the audience's. Let us see a little more action, and new and more interesting characters. Otherwise, this will be yet another failed spin-off. Takes place in L.A which gives the audience their first look at the West Coast in The Walking Dead (2010) universe.